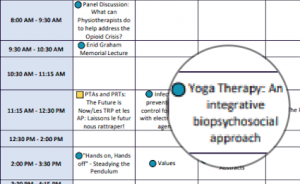 In a first for both professions, physical therapists and yoga therapists Neil Pearson, Diana Perez, and Shelly Prosko presented a session on integrating the two fields in practice at Congress 2018 of the Canadian Physiotherapy Association (CPA). The group also presented a full-day precongress course on this integration, with a focus on chronic pain, musculoskeletal and pelvic-floor rehabilitation, and wellness care. Alongside the more expected offerings at a physical therapy (PT) conference—”Managing Low Back Pain” and so on—Proskso says their intentions were partly to enhance PTs’ understanding of the similarities and differences between yoga, yoga therapy, and yoga in PT. They also discussed the scope of practice of each field, highlighting the differences and areas of overlap. A version of this report appears in the Winter 2019 Yoga Therapy Today.